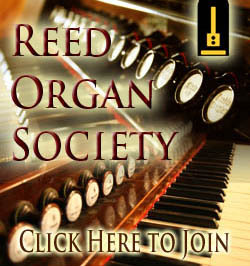 Founded in 1981, the Society is an international, non-profit organization devoted to the appreciation, study, collection, restoration and preservation of reed organs. Membership is open to anyone who is genuinely interested in reed organs. If you enjoy these organs and want to learn more about them, there is a place for you in the ROS. 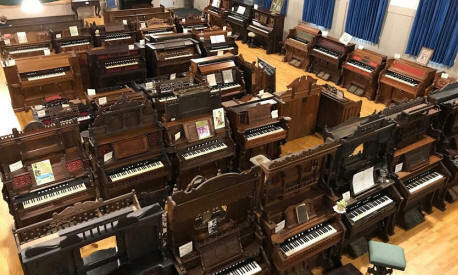 The scope of instruments ranges from harmonicas, accordions, concertinas, and lap organs, through melodeons, harmoniums, parlor, chapel, and church organs to mechanical player organs, whether they be foot-pumped, hand-cranked, or motorized. To bring together through publications, correspondence and meetings all persons seriously interested in all types of free reed instruments. To encourage the restoration and preservation of extant instruments by members and the general public. To make reed organs known as historically important, as well as musically viable instruments for present-day use. To encourage public performances of extant and new reed organ music; and to advise on performance techniques. To foster research of a scholarly nature in the reed organ field, and to encourage publication of these findings in both the ROS Quarterly and other related journals. To survey and document as many extant reed organs as is possible. 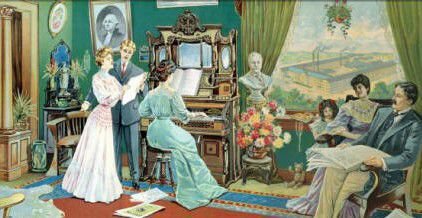 To foster the publication of reed organ musical compositions and arrangements; to locate and preserve extant reed organ music; and to reprint all types of reed organ publications and related materials for the benefit of the members and the public at large. 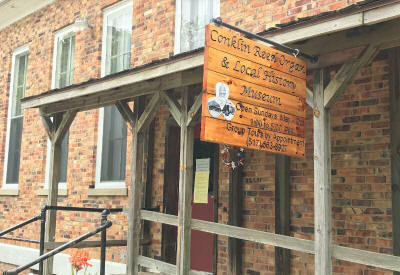 The 2019 Gathering of the Reed Organ Society will take place at the Conklin Reed Organ Museum, in Hanover, Michigan, on October 17-20. The theme is based on restoring and playing reed organs. See first hand how to tune, or how to recover bellows with new rubber cloth. More information coming soon! The 2017 ROS Gathering in York, PA was a great success! Thank you to Mark Herr for all of your work in hosting this event! The registration of your reed organ is most welcome! You do not need to be a member, and it is free! This information is extremely valuable for researching and finding the dates, stop names and many other missing pieces of information that are no longer available. 1. Online ROS Membership Signup Online Membership Forms will be kept for 30 days pending payment of dues. You may mail a check or Money Order to the membership secretary or use the "Join Now" tab below to pay online via credit card or PayPal. A PayPal membership is not required. 2. Form Download and Print, Mail the completed form to the Membership Secretary at the address below along with a check or money order for the membership dues. Memberships are for one calendar year and include four Quarterly magazines, annual Directory, and incidental mailings. Persons joining before October 1 will receive back publications issued for that year. Those joining after October 1 will be credited with the following year's membership unless requested otherwise. Household memberships are available. Add $10 for one additional voting member; however there is one set of publications issued per household. Reminder: Complete both a data sheet and make the dues payment selected!